Every October pharmacists and medical suppliers from all over the world come together at the prestigious Pharmacy Show at the NEC in Birmingham. This year was even more special as it was the show’s 10th anniversary, and attendance was spectacularly high. Rumour has it that a number of celebrities such as the infamous Jonny Wilkinson – England’s brilliant rugby player were visiting. We didn’t spot him though as we were enjoying the pleasure of meeting and sharing our NHS story with hundreds of interesting pharmacists. 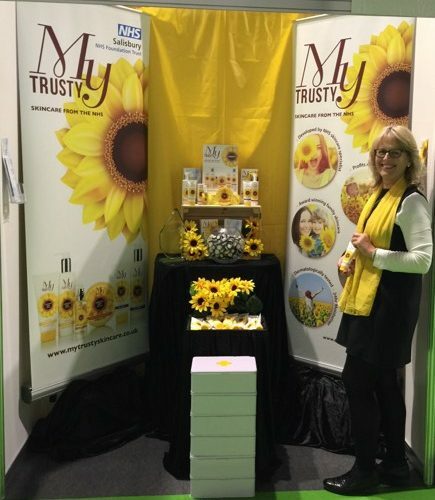 Pharmacists and doctors commented how refreshing it was, and truly ethical, to see that an NHS Trust had taken the initiative to commercialise and own an effective skincare range for the wellbeing of patient’s skin – especially as all profits are reinvested back into the NHS. What was amusing was the number of calls prior to the event, asking us if we would like them to build and design our stand. We did think (only for a minute!) on what could they possibly do better than we could with our 2m x 1m stand???? Who needs a designer when you have our skills and expertise with a ladder and some double sided sticky tape. Perhaps we should make this a new side line? All in all, it was a fruitful 3-days for the team, and despite the sore feet and long, long drive, we managed to make some excellent connections, which we hope will lead to more retail outlets for My Trusty. Watch this space ….. I would like to receive marketing communications about MyTrusty products, news, events and promotions. I know that I can unsubscribe at any time.